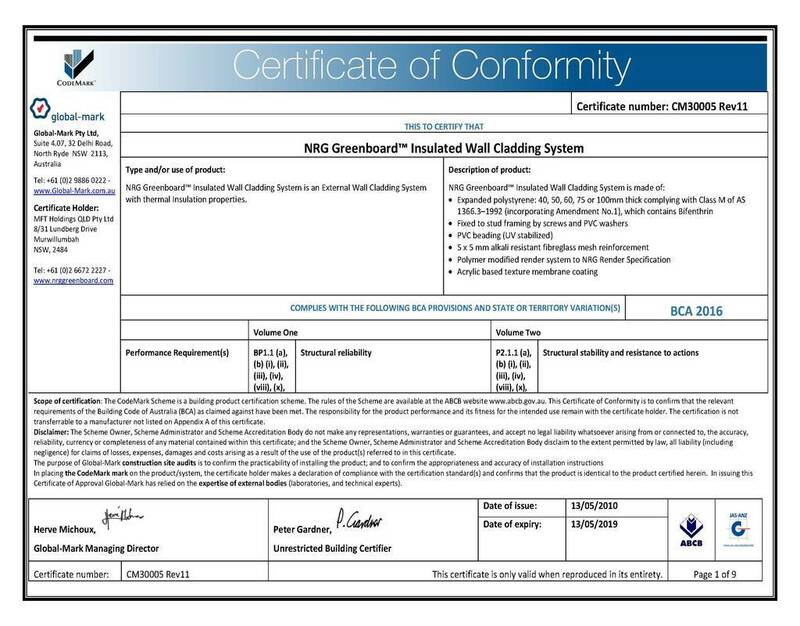 Due to recent speculation surrounding certain External Cladding Systems and the withdrawal of various CodeMark Certificates, NRG Building Systems would like to highlight that the NRG Greenboard Cladding System is fully compliant with all regulatory bodies. NRG would like to identify the advantages of using the NRG Greenboard System and point out the difference compared to other Cladding Systems on the market. NRG Building Systems was the first company to achieve CodeMark Accreditation which complies with the National Construction Code (NCC). Building certifiers are now insisting on accredited Expanded Polystyrene Cladding systems. NRG Greenboard is also BAL29 Compliant and can be used in all bush fire areas up to and including BAL29. This BAL29 rating can be obtained by using 75mm or 100mm NRG Greenboard and following certain specifications. Insurance companies are also insisting on CodeMark Accreditation and BAL 29 rating on Expanded Polystyrene Cladding Systems. NRG Greenboard has achieved both which gives home owners the peace of mind that their house can be fully insured. NRG has also completed multiple tests to ensure that the NRG Greenboard System is safe and reliable when used in accordance to our specifications. NRG’s most recent tests are as listed below. All certificates, test results and specifications can be viewed at https://www.nrggreenboard.com/accreditations. The use of the NRG Greenboard System also has cost saving factors which positions NRG Greenboard competitive when compared to other external cladding systems. These contributing factors are as listed below. Installation of the system is very quick and non labour intensive due to its lightweight properties. The finished rendered system is 30% cheaper then rendered brickwork. High thermal ratings of the system greatly reduces energy costs. In some cases there is no need for internal insulation or sound batts due to the system having sufficient ratings on its own. Cheaper footing costs due to reduction in weight. Up too an extra 7-8m² of living area is achieved when compared to Brick Veneer. One of NRG Building Systems core beliefs is that the use of Expanded Polystyrene is greatly beneficial to the construction industry when used correctly. This belief is supported by NRG Greenboard’s vast amount of favourable properties that surpass any other external claddings on the market. The NRG Greenboard System is a high density, insulated and flame retardant cladding system that when used with other building products can achieve a 6 star energy rating. NRG Greenboard is manufactured from high density, ridged, expanded polystyrene impregnated with flame retardant which quenches the burning process in the case of a fire. NRG Greenboard also incorporates Bifenthrin which acts as a vermin retardant. NRG Greenboard requires less energy to produce than other traditional building materials and contains no CFC’s or HCHC’s. NRG Greenboard does not contain ozone depleting substances and none are used in manufacturing. NRG Greenboard can be 100% recycled and can be used for extra insulation or reground and added to virgin material. NRG Greenboard’s insulation values are one of its greatest qualities which when used is lieu to other external cladding products such a Brick, Block and Hebel can create a highly thermal rated home. NRG Greenboard also has great acoustic properties. Innova Duragrid available now! "CONGRATULATIONS!" To the plasterer of the year Craig Rutledge of C A Rutledge Plaster Pty Ltd FIND OUT MORE Look what they are saying about us in the industry, View Build Home magazine Article For all plasterers out there, we have some amazing monthly specials at www.plasterdeals.com.au.